El USS Zumwalt durante sus pruebas de mar, el 7 de diciembre de 2015. ↑ Wertheim, Eric (Enero de 2012). «Combat Fleets». Proceedings (Annapolis, Maryland: United States Naval Institute) 138 (1): 90. ISSN 0041-798X. ↑ «DDG 1000 Flight I Design». Northrop Grumman Ship Systems. 2007. Archivado desde el original el 2 de diciembre de 2008. ↑ a b c d Kasper, Joakim (20 de septiembre de 2015). «About the Zumwalt Destroyer». AeroWeb. ↑ GAO-05-752R Progress of the DD(X) Destroyer Program. U.S. Government Accountability Office. 14 de junio de 2005. ↑ «The Navy Just Christened Its Most Futuristic Ship Ever». Business Insider. 2014. ↑ «Navy Designates Next-Generation Zumwalt Destroyer». US Department of Defense. 7 de abril de 2006. Archivado desde el original el 22 de marzo de 2009. ↑ «PCU Zumwalt, CAPT James Kirk, Commanding Officer». US Department of Defense. 30 de octubre de 2013. ↑ Patterson, Thom; Lendon, Brad (14 de junio de 2014). Navy's stealth destroyer designed for the video gamer generation. CNN. ↑ a b «Largest destroyer built for Navy heads out to sea». Fox News. ↑ baltimore.cbslocal.com (ed.). «Historic And Cutting Edge USS Zumwalt Commissioned In Baltimore». Consultado el 16 de octubre de 2016. ↑ news.usni.org (ed.). «Zumwalt Destroyer Departs Bath Iron Works for San Diego Homeport». Consultado el 16 de octubre de2016. ↑ a b c d Smith, J.Y. (3 de enero de 2000). 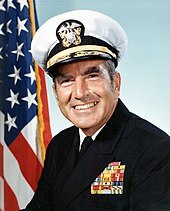 «Navy Reformer Elmo Zumwalt Dies». The Washington Post. ↑ List of destroyers of the United States Navy, Omics Group, consultado el 23 de diciembre de 2015 (en inglés). ↑ NDAA 2007 - National Defense Authorization Act for Fiscal Year 2007. (109-452) US Government Printing Office. 5 de mayo de 2006. pp. 69-70. ↑ «Navy Awards Contracts for Zumwalt Class Destroyers». Navy News Service. 14 de febrero de 2008. ↑ «BIW News February 2009». General Dynamics Bath Iron Works. 1 de marzo de 2009. Archivado desde el original el 14 de abril de 2012. ↑ a b c «Flash Traffic: Keel Laid for 1st DDG-1000 Destroyer». The Navy (Navy Leage of Australia) 74 (1): 15. Enero de 2012. ISSN 1322-6231. ↑ Cavas, Christopher (3 de octubre de 2013). «New Ship News – Sub launched, Carrier prepped, LCS delivered». Defense News. ↑ «Navy Cancels, Postpones Zumwalt Christening». United States Navy. 11 de octubre de 2013. ↑ Geoffrey Ingersoll (29 de octubre de 2013). «The US Navy's Most Intimidating Creation Yet Just Hit The Water». Business Insider. ↑ «El Zumwalt, un ingente destructor de la Marina de EEUU, inicia pruebas oceánicas en el Atlántico». Euronews. 8 de diciembre de 2015. ↑ «PCU Zumwalt». US Navy. ↑ «El destructor fantasma USS "Zumwalt" se avería en el Canal de Panamá». Infodefensa.com. 26 de noviembre de 2016. Wikimedia Commons alberga una categoría multimedia sobre USS Zumwalt. 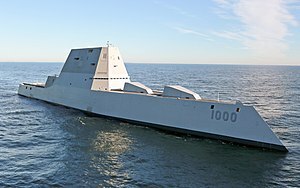 Bautizo del Zumwalt (DDG 1000), web oficial de General Dynamics. DDG-1000 Zumwalt / DD(X) Multi-Mission Surface Combatant—GlobalSecurity.org, sitio web sobre la clase Zumwalt.